No 6, Lorong Asas Jaya 21, Kawasan Industri Ringan Asas Jaya, 14000 Bukit Mertajam, Penang, Malaysia. 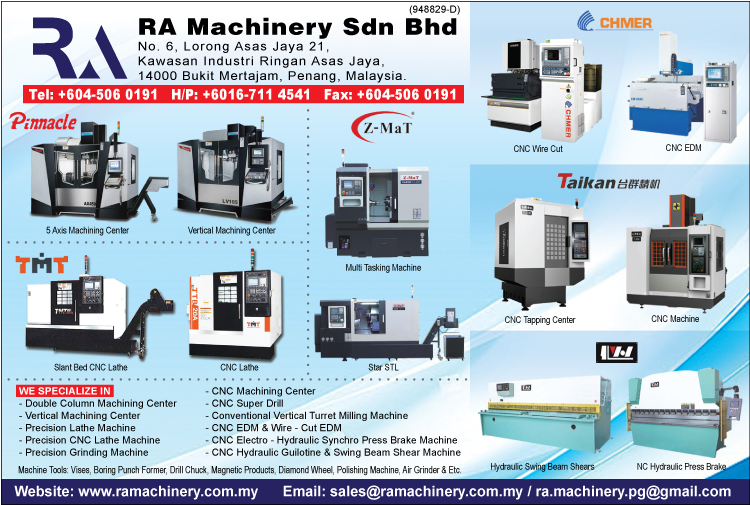 RA MAchinery SDn Bhd specializes and servicing of machineries and related operating software for use in the precision machining industries. We mainly deal with CNC lathe, CNC Vertical Machining Center, Lathe, Milling, Power Press, Guillotine Shears, Press Brake, Surface Grinding, Drilling, Shaping, Slotting, Auto Lathe & used machinery. RA Machinery Sdn Bhd stands for innovation and customer care. We strive to provide outstanding service and high-performance machine tools at reasonable prices to our customers. We promise the highest quality produts and wishes to work together as business partners.